I took rif to Dain Ti Hill earlier for lunch today. I’ve been there twice during the MMU Pageant (they are the pageant’s official restaurant) and found some of the dishes quite interesting but expensive. Since they are having a 50% discount promotion with Citibank (till 30th September 2008), I decided to treat him to lunch here. 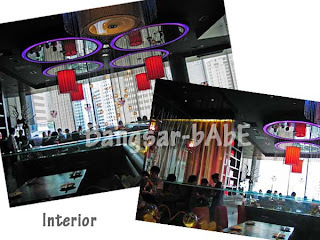 The restaurant’s decor was inspired by the Tang Dynasty, but the food served is anything but typical Chinese. Most of the dishes have been given a western twist with pretty presentation. The lanterns were of different colours (purple, pink and red) and the sofas were matching too. rif found the decor unique, but I found it OTT. Too much details, and it screams diva. We ordered the Sauteed Asparagus, Pumpkin Potato Salad, Beef Noodles, Pork Chop Rice, Deep Fried Chicken With Mustard Cream Sauce and Emperor’s Roll. For drinks, I chose the Honey Original Vinegar while rif settled for the Mixed Fragrant Green Tea. I thought my Honey Original Vinegar was very nice and refreshing. I liked how sour and thick it was – tasted a bit like Apple Cider, only much nicer. You’re given ice cubes to dilute the vinegar if it’s too thick for you. 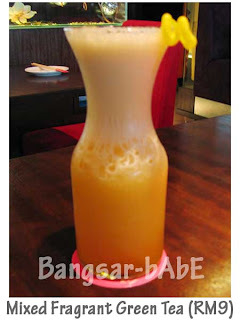 rif’s fragrant tea was alright – very diluted compared to mine. I thought it was nothing special, tasted like jasmine tea. He however liked his better than mine. We started off with the potato pumpkin salad as our appetizer. 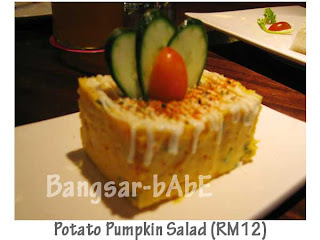 A Japanese and western fusion, the mash potato and pumpkin was mixed with roe and drizzled with mayonnaise. The salad’s texture was soft and melts in the mouth. A good starter. The Sauteed Asparagus with Gingko Nut was quite nice. 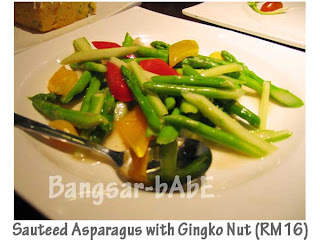 The asparagus sticks were crunchy and lightly tossed with capsicums and gingko nuts. My beef noodles was mediocre. The gravy tasted like miso soup, but a bland version of it. I thought it was overpriced considering there were only a few slices of beef on top. The kimchi however had a hint of mustard in it, giving it a nice twist. A pity it was such a small portion, as I ran out of Kimchi halfway through my noodles. I asked for another serving only to be told that they would charge me RM1 for it. 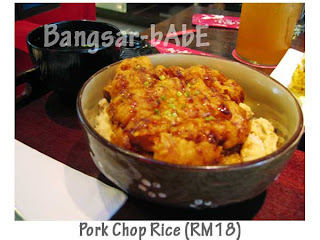 o_0 I paid the RM 1, but for a high-end dining restaurant, I thought they were really “KIAM SIAP”! The pork chop rice tasted better than my beef noodles, but it was still within the mediocre category. The crispy pork chop was juicy on the inside. The rice however lacked flavour no thanks to the bland gravy. The Emperor’s Roll (Baked Rice roll stuffed with crab meat, pork floss, avocado, papaya, honeydew, topped with fish roe, mustard sauce and mayonnaise) was very unique. 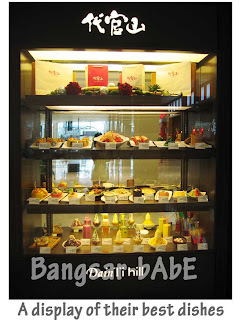 It was a fusion of Japanese and Taiwanese cooking and served hot. The rice was sweet and the mustard topping brought all the flavours together beautifully. rif too, agreed that the roll was nice. We both liked the Deep Fried Chicken With Mustard Cream Sauce. 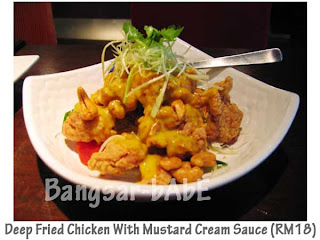 The combination of the mustard sauce was great; it was salty, creamy and sweet with a slight hint of mustard. The chicken was deep-fried till crispy on the outside while juicy and tender on the inside. We ate everything….including the garnishing. Hehe… Very moreish! 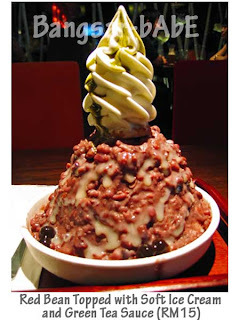 We ended lunch with a bowl of Red Bean Ice Mountain. It’s actually called red bean topped with soft ice cream and green tea sauce. Haiyo! Don’t know why they must give such long names to their food. So difficult to remember! 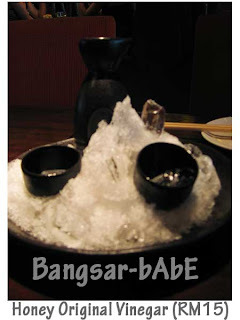 >:( The ice shaving was smooth and when mixed together with the red bean paste, the combination was lovely – very nice and velvety! I would prefer if they added more milk in it, as there were more ice shavings to red bean topping. Luckily, the ice cream made up for the lack of cream. I have to say…service was complete and utter crap. A world of difference from the time when I was in the pageant, where service was extremely good. This time, the waiters were serving customers half-assed and many tables were left unattended. Very disappointing. They messed up my order for dessert, and had the guts to ask me to “JUST TAKE IT”. When the bill came, they charged me double for the dessert and when I pointed it out to them, they reluctantly changed it. 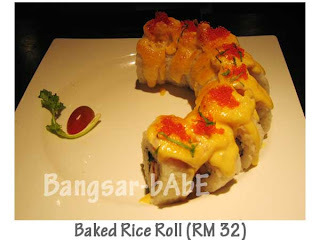 After 50% discount, the bill came up to RM91.20 (before discount – RM152) inclusive of service charge. That’s RM 15.20 for lousy service! Apart from crap service, lunch was not bad but VERY expensive without the discount. Portions are quite small in general, except for the Emperor Rolls. Verdict: The Emperor Roll, Chicken with Mustard Cream Sauce and red bean dessert are worth trying. I’ve tried the mango ice mountain before, and it was OK only. Don’t bother ordering their noodles. that sounds bad..having alr heard abt bad food..now looks like discount doesnt help out a greal deal too (no Citibank card sommore,sigh)..i wont b dropping by too soon.. The food wasn’t THAT bad la. Got hits and misses, so you have to choose with caution. But the crappy service really marred my dining experience. I was about to say that the place looks okay but stopped when I read the last paragraph! Sorry to hear about the lousy service; it’s really crappy be treated like a criminal or a cheapskate when you point out their mistake and they behave like that! christy: Ya…I’m really disappointed they behaved that way, especially after how well they treated us pageant girls. aww… i hate places with lousy service >.<"
hmm… unimpressive. high end dining comes with certain (expectable) standard of service. ling 239: Especially when you have to pay so much service charge! jeen: Yeah, we ordered a lot. 😀 Actually, I ordered what I wanted to eat because during the pageant, there were so many interruptions that I couldn’t EAT IN PEACE! And yes, knowing me, crappy service is a huge no no. Hmmm… i’ve read so much negative reviews about this place and now your bad-service experience tops it all. Don’t think i’ll be heading there soon since they’re so snooty – i hate tat! Furthermore, no citibank card – i just dumped it – also becoz of CB’s bad service but tat’s another story! Don’t know if they are snooty or they just couldn’t be bothered. 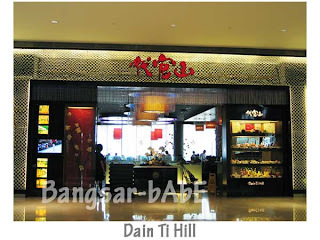 Dain Ti Hill isn’t THAT popular, plus it’s expensive for that type of food. They should at least make sure the service is good so more people will go there.